"Congas of Doom I," "Congas of Doom II"
10/29/2012 1/28/2019 by tom moody Comments Off on "Congas of Doom I," "Congas of Doom II"
The cruddy, sick old tree in front of my apartment fell down 20 minutes ago, right in the middle of the street. 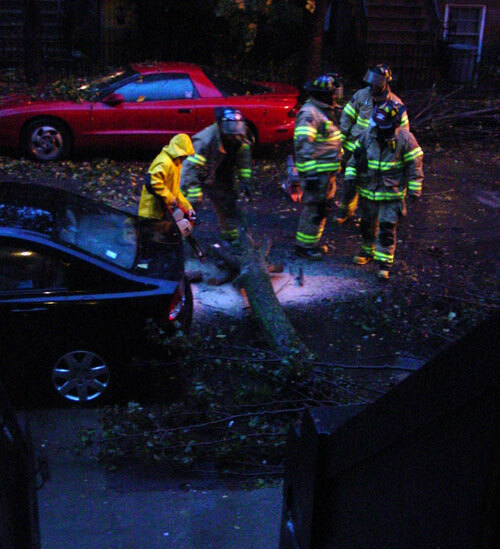 The city crews are on it -- I heard the chainsaw but not the falling tree (loud music in studio). It just missed hitting that car. Update: Looking around the web it seems almost all the Hurricane Sandy photos are arty, soft-focus, and hand-tinted-looking. This might be the first all-Instagram documented disaster. Future generations will hate us for our present conceits (photo above made with a Sony™ camera).